Now, you may be reading this post and instantly think 'What? A plain T-Shirt?! Thats boring.' But this boring item is going to be your go-to when you're running late, just popping to the shops, meeting the girls for lunch or having a casual chilled day. The plain white tee is versatile in the fact it looks good with ripped jeans, trainers and a faux leather jacket or dressed up with a cute skirt and heels/boots. This stylish staple can go from day to night with the alteration of a few accessories and still look naturally chic. If you want a T-Shirt that is going to fit perfectly and not discolour, then there are lots of styles to suit each body type (v-necks, round necks, with or without breast pockets) that are from big designers - so may cost a little more than a H&M basic, but are worth forking over a little more than usual. Make sure the fit is slightly loose and baggy, so you can mix this item up with as many things as possible, tucking it into pencil skirts, layer it over mini skirts, or just have it layered under an open chambray shirt. The plain white tee doesn't have to be 'boring' experiment with more trendy cuts, such as a mullet cut (so the back of the t-shirt is longer than the front), asymmetric (where the bottom hem is slightly off-balance), deep plunge neck line (self-explaniroty) etc. I shouldn't have to to say much, let alone anything at all about why you should own a pair of classic blue skinny jeans, they are going to be worn more times than you will be able to count with pretty much everything. Whether yours are from an expensive designer brand or from your local high street retailer, these are one of the biggest essentials to any wardrobe. Now I'm trying not to be too specific with this one, as cut and colour will vary largely on your shape, size and personal aesthetic when it comes to choosing a style. A dark jacket is always a good shout as it is likely to co-ordinate with your clothes throughout the year, especially in the transition to winter, so make sure it isn't to big and bulky and has a style that isn't suited to one type of weather, as fur in summer isn't going to bode well with sunshine or British rain if you live in the UK. I would say if you can make this as light as possible and less of a 'coat' but more of a throw over to complete your outfit then you are going to have met your perfect match. For me a like a coat to go with nearly everything I own, saving statement coats for certain outfits or occasions, aside from that a clean cut jacket with the usual two pockets, a neat blazer style lapel and lightweight are my checkpoints for and jacket. I particularly love blazers and the preppy smart look, so a jacket that I can incorporate with the rest of my clothing and be suitable for day time errands and more dressed up events is a big winner for me. If you're not the biggest fan of feeling like you're back into your youthful school years hear me out on this one, whether you work in an office environment and need to look formal for your typical 9-5 or not a pair of smart dark trousers are a crucial addition to your wardrobe. You never know when these are going to come in handy and having a pair to save you in last minute situations to hand at the ready is never going to hurt. You may be wearing clothes like this all day everyday or maybe you're far more relaxed in how you like to present yourself but these trousers are the ultimate 'you never know situation type' trousers. It's just something you've pretty much got to own whether you like it or not, as you are going to need to pull them out at some point, so having a pair lurking between your weekend wear isn't going to hurt you. They don't have to look like black school trousers, choose whatever cut and style you like, pick a material that you want to wear and they won't seem like such a chore or effort to put on. Thin chiffon, thick wool, pinstripe, checkered/plaid, plain or daring, high waisted or low rise, skinny fit or harem the choice is yours! Just make sure the tick the suitable occasions such as job interviews, funerals, important business meetings, places where you have to look presentable and impress people (house viewings, meeting your partners parents etc.) and you know you're in safe hands. The colours you should be looking at are the neutral shades of black, grey, navy and possibly white. As mentioned in point 3. above sometimes the plain jacket isn't going to work with some outfits, a pastel colour pallet or perhaps more girlie look or even just want to look extra 'wow' and want to make a statement. This is where the statement jacket comes into play. There's no rules to what print or style of jacket you should go for, as long as it reflects your style and sums you up as a person or what type of aesthetic you want to present with the way you dress. Be it a bold colour, daring print, quirky cut, oversized faux fur, as long as it says something about you and your style, this is your chance to make a statement that best works for you. 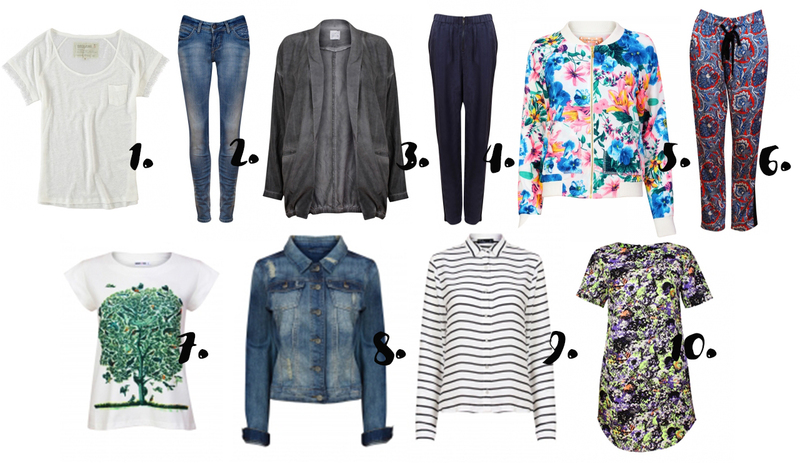 For me I would choose a floral or bright colour that I could wear with the simple basics such as the plan white tee and classic blue skinny jeans mentioned in points 1 and 2 above. I wouldn't recommend clashing too much (such as double prints) as you want the jacket to be the first thing people notice and draw their attention too. Therefore if you have a more casual or 'basic' outfit, you can jazz it up with a pop of print or colour without looking over the top and trying too hard. And again, whilst we talk about making a statement, the same rules can be applied for your bottom half of your outfit. In exactly the same way as the previous point about the top half of your look, a statement trouser is a simple way to update your look when you're feeling too lazy to thick too much about what you're wearing but still want to grab attention and say 'hello' to passers by (you know without having to actually say anything). If you want what you wear to do the talking or add a bit of attitude to get you in the frame of mind for something. Paisley, vertical stripes, polka dot, leopard print - whatever you want to pick make sure it will work with the rest of your outfit. I would personally pick colours that co-ordinate with the rest of your wardrobe, again going for more neutral tones and colours and focus on a print design. However a pop of colour be in bright and bold or pretty and pastel is a good way to wear the statement trouser for those who don't know how to wear prints. Avoid 'trend' based patterns such as a tribal design or colours such as neons and go for designs that come into fashion year in year out with colours like red, green, burgundy, mustard etc. Whether you're into casual dressing or not, having a printed T-Shirt is just one of those essentials you will be glad you bought when it comes to those lazy Sunday afternoons when you're hanging about the house, chilling with magazines and doing the usual food shop. Throw it together with some ripped jeans and converse for that relaxed and comfy combination that is still stylish no matter how slung on it was. You don't have to splash out on an overpriced designer logo, just a cheap t-shirt will do, as long as you like the design, it fits and you are happy to wear it, in this case that's all that matters. Don't worry too much about the latest trend in cut or fabric, an organic cotton with a basic round neck is all you need. This is basically the back up choice when you're too lazy for anything else but don't want to hit the supermarket looking like you're wearing your pyjamas. No matter how comfy they are or tempting the thought might be, save the embarrassment and wear this instead. A good denim jacket will serve you well for years and years to come. Take the time to try on lots of different cuts and styles but make sure you opt for a timeless design in a plain blue denim that isn't going crazy trying to be trendy with buttons, prints or cropped length. Pick a nice fit that is tailored to your shape but baggy enough for you to layer underneath and wear a versatile range of outfits, in a length that sits at your hip bone. This way every year your denim jacket will look good throughout spring, summer, autumn and winter without you growing out of the trend that was popular at the time you bought it or feeling to old for dyed ripped denim years later. Keep it sweet and simple by choose an option as plain and understated as possible so it can be worn with a variety of clothes such as black skinny jeans, mini skirts, tartan, festival fashion, baby doll dress, skater skirts, maxi-dresses etc. etc. The list can be endless providing you go for the most understated jacket possible, otherwise this is a pointless waste of money on a fad trend that could have been timeless in your wardrobe and grown and developed with your style, rather than clashed against it. Ah stripes, a personal favourite of mine that I have dotingly loved for years now. When you want a bit of Parisian chic or just a smart or casual look bring out the stripes and instantly your outfit choices have become a simple case of 1+1=2. These babies go with skirts, trousers, jeans, trench coats, faux leather, blazers, denim jackets, flats, heels, boots. You name it - it will probably go. The colour co-ordination choices are all waiting for you to pair up. My favourites are navy, camel, browns, mustard, burgundy, black, white and red as they aren't going to look dated and will always go well together. Again you can really experiment with cut, shape and style of what type of top you want your stripes to be on. It could be a blouse, collared shirt, t-shirt, long sleeved top, tight round neck, turtle neck, jumper. Pretty much all sorts. The basic point of this one is get some stripes in your life and thank me later. Finally, the printed dress. A perfect solution for special occasions, work or business meetings, lunch dates or any time you can't think of what to wear, the printed dress has your back. Pick a print (such as floral)s, that comes around each year to avoid having to splash out on constant changes in pattern and print trends and always remaining effortlessly stylish year after year. Your dress doesn't have to be designer or lavishly expensive. The dress I get the most compliments about is an old t-shirt style dress, which is actually just an oversized long top from River Island but it works with everything else I own in terms of shoes, jackets, jewellery or handbags - so make sure your dress is the same and it's not something you will get bored of and end up hating by the next time you go to wear it. The choice of cut, style, material and colour is really for you to experiment with, so try lots of different designs out before you commit to your perfect printed dress, as it has to serve you well for a long time. Make sure the dress cut is designed for your shape as you will look far better if you dress for your body type rather than size as dresses are all designed to suit different figures depending on what type of dress it is and what neckline it has. Don't rush and buy the first printed dress you see, really explore your options, working out wheats best for you in both design, practicality of wearing it in terms of comfort, occasions and reasons to wear it as well as co-ordinating it to everything else you already own.